It’s been an exciting couple of months for the Archive team, who have been working hard to develop our offer and give more people access to our fantastic collection. We’ve refreshed our Marks In Time exhibition here at the Archive with exciting new exhibits on areas such as International and brand and marketing. We also have a fab new interactive app allowing visitors to create their own collection of favourite archive items and share them via social media. We are delighted to have been recognised by the Visit England Quality Accreditation Scheme for our visitor experience and have more changes up our sleeves over the coming weeks so it’s a great time to pay us a visit! Aside from working on our own exhibition, we have been collaborating on new projects with other organisations. We’re thrilled to have teamed up with the National Trust to create the new ‘Revolutionary Fabrics’ exhibition in the Cotton Gallery at Quarry Bank Mill in Styal near Manchester. Showcasing a handpicked selection of M&S garments dating from the 1940s to 1990s, the exhibition features previously unseen items which highlight the fabric innovation and scientific techniques which made such clothing possible. 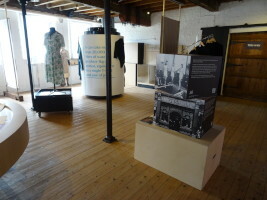 Another exciting collaboration for us has been the Imperial War Museum’s ‘Fashion on the Ration’ exhibition. Katie from our team was interviewed as part of this great exhibition which looks at how fashion survived and even flourished under the strict rules of rationing in 1940s Britain, often in new and unexpected ways. Finally, we’re excited to have worked with Leeds Museums on their new ‘Age of Glamour’exhibition that has just launched at Lotherton Hall. See some of our fabulous fashions on display in the exhibition focusing on the impact of Parisian design on British fashion during the Fifties. External exhibitions are a great way to give more people the opportunity to discover our story and engage with our fantastic collection. So, if you’re around Manchester, Leeds or London, don’t miss the chance to drop in!